Lawyer, Leader of the Grassroots United Front and National Capital District Regional Seat candidate, Paul Paraka has vowed to remove a law on betelnut, which he says, has affected the lives of many grassroots people living in the city. 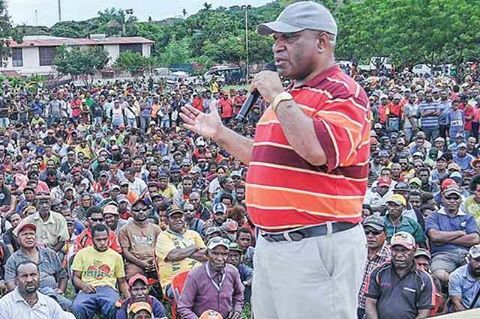 Mr Paraka told people at the Morobe block at 9 mile suburb outside Port Moresby recently, that if he is elected governor, he will make sure to compensate all those who have been victims of the betelnut ban law. "Buai em kaikai blo tumbuna blo ol Kerema. "Buai em kaikai blo tumbuna blo ol Papua. "Buai em mipela ol Highlands na ol narapela kisim na maket, na kisim mani na baim skul fee, baim kaikai blo mipla, wokim aus, baim na ron lo bas. "Em source blo income blo yumi. "Its our life. Its our culture," Mr Paraka said. Mr Paraka's Grassroots United Front is putting up 111 candidates to contest each of the 89 open seats and 22 provincial seat. As part of his campaign strategy, Mr Paraka is offering free legal service to all grassroots people who are unable to afford basic legal services.